There is an infinite array of prisms and antiprisms. When the faces involved are all regular, the models are uniform. (See the glossary for definitions of these terms). The photos below show all the prisms and antiprisms with 5-fold dihedral symmetry, and their duals. These models were made using nets generated by Great Stella. 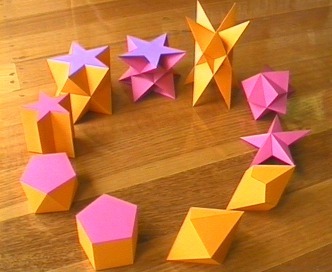 They could also be made using Stella4D, and the convex models could be made using Small Stella. Click on the images below to see a bigger picture and get more information about them.